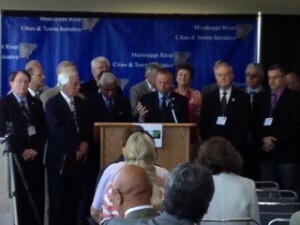 The Mississippi River Cities and Towns Initiative marks real progress toward unified approaches for America’s great waterway. At their second annual meeting in St. Cloud, Minn. in June, the mayors expressed their understanding of and commitment to whole-river approaches to the Mississippi River, a significant change from the multi-jurisdictional, place-based approaches. Hooray! The mayors’ progress in getting Mississippi River caucuses launched in congress is a major first step and commendable as well. Their Memo of Common Purpose with the Corps is a second great step to that end. I was pleased and gratified to have had the chance to attend this conference and see this progress first hand. Still, there is an unaddressed component needed to successfully create and establish a framework for unified approaches to the Mississippi. That essential component rests with the public’s willingness to support a whole Mississippi River management approach, a considerable challenge for any water system let alone that of America’s waterway. This is where A National Dialogue for the Future of the Mississippi River presents a unique opportunity. We know from history and the study of social change that public support is more effectively gained when the key stakeholders buy into the change. We know that the commitment to seeing that change happen comes when stakeholders see first-hand they have something to gain if the change happens. That’s why the World Wildlife Fund sees stakeholder involvement from across a watershed as essential to integrated river management policy. And the EU Water Framework Directive states, “In getting our waters clean, the role of citizens and citizens’ groups will be crucial.” The Mississippi River and its watershed need the same. Momentum is building. 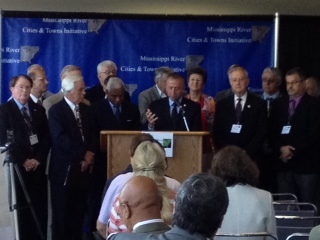 We should continue to hold meetings of organizations and leading Mississippi River stakeholders. But it’s time to consider how to include the public in the process. Those organizations involved in the increased river collaboration should consider the ways they can build sustainability into their collaborative outcomes, whether its health indicators for the watershed, compacts for the sake of the Delta or multi-jurisdiction agreements on accessibility. A National Dialogue for the Future of America’s Waterway goes beyond stakeholder input to stakeholder action. The AmericaSpeaks’ process imbedded in the Dialogue – face-to-face, multi-location, real-time – provides for whole Mississippi River civic engagement that not only creates a shared vision and framework for integrated river decision making, it builds stakeholder commitment. Furthermore, a National Dialogue could go a long way toward elevating the Mississippi River status as our national waterway throughout the country, thereby expanding public support beyond the River and the Watershed. It’s an opportune time to include this capacity-building effort as a component in talks throughout the river valley. Without it, proposed approaches may be difficult to achieve and likely impossible to sustain. This entry was posted in Culture and History, Economic, Environment, Future of the Mississippi River and tagged America's Waterway, EU Water Framework Directive, Mississippi River Cities and Towns Initiative, National Dialogue for the Future of America's Waterway, U.S. Army Corps of Engineers, WWF Keys to Effective River Basin Management. Bookmark the permalink.